I recently ran across Jodi's blog and she has some amazing adoption art! She is currently having a giveaway and you should really check it out! Who wouldn't want free art?!?! 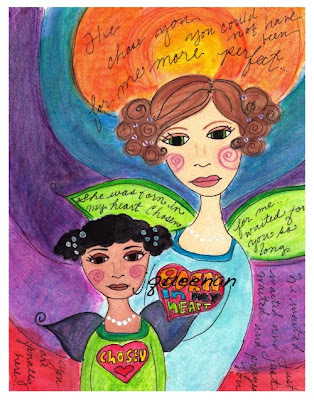 Plus all the profits from the sale of her art goes towards her adoption from Ethiopia as well as Kolfe Boys Home. So pretty much its a win win. Cute art. Help a family bring home their sweet babe. Great cause helping Kolfe. Check it out. I can't get to the blog but would love to see the art! beautiful ... Thanks for sharing!